Leadership and supervision of a highly effective, respectful, diverse, multi-disciplinary staff working in the areas of: Violence Prevention, Adolescent Health Promotion, Hmong Community Health Promotion, Health Equity and Chronic Disease Prevention. Budget, grant and contract development and management including oversight of Statewide Health Improvement Program (chronic disease prevention) and Healthy Teen Initiative (teen pregnancy prevention) grant programs. Leadership in development of seven television productions in partnership with Twin Cities Public Television. Co-founder of The Initiative for Peaceful Families and Communities in Ramsey County, including development of nationally recognized Wakanheza Project and comprehensive workplace violence prevention tools. Articles published in peer-reviewed journals. ​Teaching courses on violence prevention and community systems organizing at Augsburg College, College of St. Catherine, Hamline University, Luther Seminary, Metro State University, University of Minnesota School of Nursing. Minnesota: Children's Hospital of MN; City of Minneapolis; City of Rochester; Dakota County; Freeborn County; Medtronic; MN Center Against Violence and Abuse; MN Center on Reducing Rural Violence; MN Council on Family Relations Annual Conference; MN Council of Nonprofits Annual Conference; MN Crime Victims Conference; MN Department of Health; MN Department of Transportation; MN Elementary School Principals' Association; MN Juvenile Justice Coalition; MN Organization on Adolescent Pregnancy Parenting & Prevention; ; MN School Principals' Secretaries Conference; MN Social Services Association; Prevent Child Abuse MN; St. John's Hospital; Stearns County. Office of the Commissioner of Baseball and the Cincinnati Reds, Colorado Rockies, Oakland Athletics, and Seattle Mariners baseball teams. Additional conferences and training in: Denver, CO; Newark, NJ; Omaha, NB; Philadelphia, PA; Chicago, IL; Grand Rapids, MI; Long Island, NY; New York University, NY; Oak Park, IL; Pittsburgh, PA; Quad Cities; San Diego, CA. 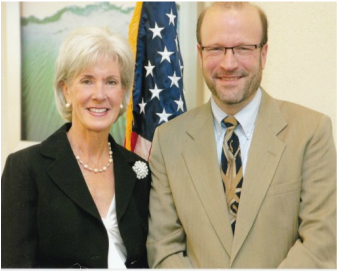 Former Secretary of the U.S. Department of Health and Human Services Kathleen Sebelius (l), presenting Donald Gault (r) with the 2011 Healthy Living Innovations Award for "Exercise Your Right to Feel Better." "Reflection, Working Toward Peaceful Healthy Communities," published Winter 2016 issue Interdisciplinary Journal of Partnership Studies. To read, click here. Working with Sand Creek Group, a national leader in Employee Assistance Programs which specializes in "exceptional EAP services to support the human spirit at work," Building Peaceful Community LLC has provided training and consultation on violence prevention policies to leadership staff with the Commissioner of Major League Baseball, and is providing violence prevention and healthy relationship training to staff, coaches and scouts with four Major League baseball teams. Creating welcoming environments in Oak Park, IL libraries.